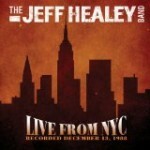 Share the post "Album Review: JEFF HEALEY BAND – Live From NYC"
It’s beginning to look like every time Jeff Healey walked onto a stage that someone, somewhere was recording the event for posterity. In the last four years alone there’s been ‘Songs From The Road’, ‘Live At Grossmans’, ‘As The Years Go Passing By’ (a 3 disc set of live material) plus ‘House On Fire’ (a collection of demos and rarities). So the question has to be asked ‘do we need yet another Jeff Healey live album?’. Well, of course, the answer has to be yes, especially this one which was recorded in New York in December 1988 – around the time of the release of his first album ‘See The Light’ which thrust him into the pantheon of great blues/rock guitar players. I remember at the time much discussion about his technique and playing ability – the old blues guys gave him much respect because of his blindness and the more contemporary players were blown away by his playing method of having the guitar laid on his lap which allowed him to use his thumb as well as his fingers whilst fretting – resulting in some blistering solo work. Jeff Healey was never really blessed with a particularly strong voice, compared with, say, Joe Bonamassa, and his own songwriting abilities were a little hit and miss, but where he shone was in his interpretations of other people’s songs – not only from the authentic blues masters of Chicago and the deep south but also the doyens of the modern age. And thus it is here, with five of the nine tracks being cover versions – but so good is Healey he just makes them his own (sorry, sounded like an X-Factor judge there – oh, the ignominy…). His versions of ZZ Top’s ‘Blue Jean Blues’, John Hiatt’s ‘Confidence Man’ and particularly Cream’s ‘White Room’ are as good as you’ll hear, as are the traditional blues of ‘Further On Up The Road’ and ‘Good Morning Blues’. The quality slips slightly with the Healey-penned ‘My Little Girl’ and especially ‘I Need To Be Loved’, but set-closer ‘See The Light’ shows he could write a good tune when he put his mind to it and the version here is nothing less than sensational with the wailing solo truly breathtaking. In his later years, Healey turned his back on the blues and ventured into jazz and, shamefully, even gospel music, but had just finished the excellent comeback ‘Mess Of Blues’ before his tragic death in 2008 at the ridiculously young age of forty one. So recordings like this are important. They show Jeff Healey at his absolute best – live in front of an enthusiastic audience playing the music we all loved him for. Who cares that his voice wasn’t that strong? Who cares that his backing band were a bit ‘workmanlike’ shall we say? Who cares that his own material was patchy? Not only was he a top bloke, but he was one of the best guitarists of his generation and so emotionally-charged was his playing it could reduce grown men to tears. That’s why we need another live Jeff Healey album. This entry was posted in ALBUM REVIEWS, ALBUM REVIEWS (Mobile), All Posts and tagged 1988, album, blues, guitar, guitarist, Jeff Healey, Jeff Healey Band, Live From NYC, review, rock. Bookmark the permalink.